A collection of decorative soaps. A detergent is a chemical compound or mixture of compounds used as a cleaning agent. A soap is a cleaning agent that is composed of one or more salts of fatty acids. Thus, by its broad definition, detergent is an umbrella term that includes soaps and other cleaning agents with various chemical compositions. Often, however, the term detergent is used in a narrower sense to refer to synthetic cleaning agents that are not soaps (that is, not salts of fatty acids). Conversely, the term soap is often used in a broader sense to include a variety of cleaning agents (such as "laundry soap"). Here, the term detergent will be used in its broader sense (to include soaps), and the term soap will be used for products that consist mainly of fatty acid salts. Detergents are commonly used in products for personal hygiene, dishwashing, and laundry. They are also used as ingredients in antiseptic agents, dry-cleaning solutions, lubricating oils, and gasoline. Although detergents are very useful, the excessive use of certain ingredients has led to adverse effects on the environment. For instance, phosphate additives used for water softeners led to an increase in phosphorus content in lakes and rivers, triggering algal blooms that in turn consumed most of the oxygen in the waters, killing fish and plants. Efforts have been made to reduce such negative effects, but the results have been mixed. The earliest known use of a natural, soap-like material was the powder of nuts from the Reeta (Sapindus) tree, a powder used by Indians since antiquity. In accordance with Ayurvedic teachings, Hindus in India were obliged to bathe at least once a day, every morning. The Babylonians used clay cylinders containing a soap-like substance, dating from 2800 B.C.E. A formula for soap—consisting of water, alkali, and cassia oil—was written on a Babylonian clay tablet around 2200 B.C.E. The Ebers papyrus (Egypt, 1550 B.C.E.) indicates that ancient Egyptians bathed regularly and combined animal and vegetable oils with alkaline salts to create a soap-like substance. Egyptian documents mention that a soap-like substance was used in the preparation of wool for weaving. It has been reported that a factory producing soap-like substances was found in the ruins of Pompeii (C.E. 79). However, this report appears to be a misinterpretation of the survival of some soapy mineral substance, probably soapstone, at the Fullonica where it was used for dressing recently cleansed textiles. The ancient Romans were generally ignorant of soap's detergent properties and made use of the strigil to scrape dirt and sweat from the body. The word "soap" (Latin sapo) appears first in a European language in Pliny the Elder's Historia Naturalis, which discusses the manufacture of soap from tallow and ashes, but the only use he mentions for it is as a pomade for hair. He mentions rather disapprovingly that among the Gauls and Germans, men are likelier to use it than women. According to one legend, "soap" takes its name from a "Mount Sapo" where ancient Romans sacrificed animals. 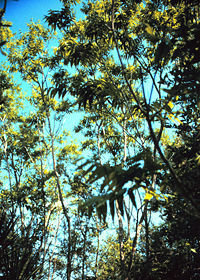 Rain would send a mix of animal tallow and wood ash down the mountain and into the clay soil on the banks of the Tiber. Eventually, women noticed that it was easier to clean clothes with this "soap." The location of Mount Sapo is unknown, as is the source of the "ancient Roman legend" to which this tale is typically credited. In fact, the Latin word sapo simply means "soap." Borrowed from a Celtic or Germanic language, the term is cognate with the Latin term sebum (meaning "tallow"), which appears in Pliny the Elder's account. Roman animal sacrifices usually burned only the bones and inedible entrails of the sacrificed animals; edible meat and fat from the sacrifices were taken by humans. Under such circumstances, animal sacrifices would not have included enough fat to make much soap. The legend about Mount Sapo is probably apocryphal. A twelfth-century Islamic document describes the process of soap production. It mentions the key ingredient, alkali, which later becomes crucial to modern chemistry, derived from al-qaly or "ashes". By the thirteenth century, the manufacture of soap in the Islamic world had become virtually industrialized, with sources in Nablus, Fes, Damascus, and Aleppo. Soapmakers in Naples were members of a guild in the late sixth century (then under the control of the Eastern Roman Empire), and in the eighth century, soap-making was well known in Italy and Spain. The lands of Medieval Spain were a leading soapmaker by 800, and soapmaking began in the Kingdom of England about 1200. Castile soap, made from olive oil, was produced in Europe as early as the sixteenth century. 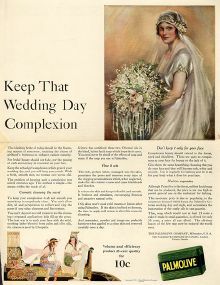 1922 magazine advertisement for Palmolive soap. In modern times, the use of soap has become universal in industrialized nations due to a better understanding of the role of hygiene in reducing the population size of pathogenic microorganisms. Manufactured bar soaps first became available in the late nineteenth century, and advertising campaigns in Europe and the United States helped to increase popular awareness of the relationship between cleanliness and health. By the 1950s, soap had gained public acceptance as an instrument of personal hygiene. A bar of blue-white offenbach soap. Until the Industrial Revolution, soap-making was done on a small scale and the product was rough. In 1789, Andrew Pears started making a high-quality, transparent soap in London. He and his grandson, Francis Pears, opened a factory in Isleworth in 1862. William Gossage produced low-priced, good quality soap from the 1850s. Robert Spear Hudson began manufacturing a soap powder in 1837, initially by grinding the soap with a mortar and pestle. William Hesketh Lever and his brother James bought a small soap works in Warrington in 1885 and founded what became one of the largest soap businesses, now called Unilever. These soap businesses were among the first to employ large-scale advertising campaigns to sell the output of their factories. Soap usually comes in a solid, molded form, called a bar, based on its typical shape. The use of thick liquid soap has also become widespread, especially from soap dispensers in public washrooms. When applied to a soiled surface, soapy water effectively holds particles in suspension, which can then be rinsed off with clean water. Thus, each molecule of soap has (a) an ionic end, which is hydrophilic (water-attracting) and soluble in water; and (b) a nonpolar hydrocarbon chain that is hydrophobic (water-repelling) that can attach to nonpolar materials such as grease and oil. These molecules form bridges between water and oil, breaking up the oil and forming an emulsion consisting of oil droplets suspended in water. Substances made up of such molecules are called surfactants. They reduce the surface tension of water, and they reduce interfacial tension between oil and water by adsorbing at the liquid-liquid interface. Diagram of how soap works. Surfactants are key components of detergents in general. Because of their presence in detergents, oil and associated dirt particles become solubilized and can be rinsed away with clean water. Many types of organic compounds can function as surfactants. They (and the detergents that contain them) are often classified into four groups: anionic, cationic, zwitterionic (with plus and minus charges), and non-ionic. In the case of non-ionic surfactants, the hydrophilic nature of one end is conferred by the presence of special functional groups such as hydroxyl groups. Most brands of laundry detergent have anionic or nonionic surfactants or a mixture of the two, although cationic surfactants have also been used. The use of cationic and anionic surfactants together is incompatible in the same detergent. The usual content of surfactants in a typical detergent is about 8-18 percent. Abrasives that scour the surfaces. Substances that modify or control pH, or affect the performance or stability of other ingredients. For example, acids may be used for descaling, or caustics to destroy dirt. Water softeners counteract the effect of "hardness" ions (particularly calcium and magnesium ions). Some form of sodium phosphate (such as trisodium orthophosphate, monosodium orthophosphate, or a tripolyphosphate) can be used here. In some locations, phosphate is no longer used due to environmental concerns, as phosphates in surface waters stimulate algal bloom. As alternatives, other chelating agents or ion exchange materials are used. Oxidizing agents (oxidizers) that bleach surfaces and destroy dirt. In North America, sodium hypochlorite based bleach additives are more common. These work at lower temperatures and do not need activation. In Europe, peroxide-based bleaches are prevalent. Fillers, forming a bulk component in many laundry detergents, modify the physical properties of the material. In solid detergents, sodium sulfate or borax can be used to make the powder free-flowing. In liquid detergents, alcohols are added to increase the solubility of the compounds and to lower the mixture's freezing point. Non-surfactant materials that keep dirt in suspension. Enzymes that digest proteins, fats, or carbohydrates. They help remove biological stains (such as stains from grass or blood). Enzymes produced by the bacteria Bacillus subtilis and Bacillus licheniformis are often used. Ingredients that modify the foaming properties of the cleaning surfactants, to either stabilize or counteract foam. Additional ingredients include optical brighteners, fabric softeners, colors, and perfumes. A high-foaming mixture of surfactants with low skin irritation is needed for hand washing of drinking glasses in a sink or dishpan. Any of various non-foaming compositions are used for glasses in a dishwashing machine. An ammonia-containing solution is useful for cleaning windows, with no need for rinsing. Windshield washer fluid is useful especially when a vehicle is in motion. 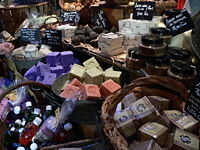 Handmade soaps sold at a shop in Hyères, France. Some individuals continue to make soap in the home. The traditional name "soaper," for a soap maker, is still used by those who make soap as a hobby. Those who make their own soaps are also known as soap crafters. The most popular process for handmade soaps today is the cold process, where oils such as olive oil are reacted with lye. 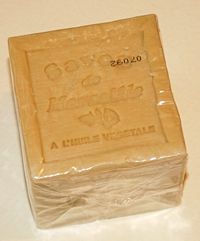 Some soap makers use the "melt and pour" process, where a pre-made soap base is melted and poured into individual molds. Some soapers also practice other processes, such as the historical hot process, and make special soaps such as clear soap (glycerin soap). 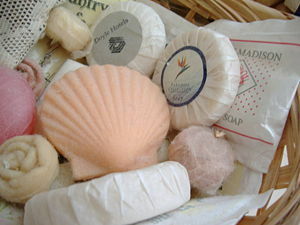 Soap is derived from either oils or fats. Sodium tallowate, a common ingredient in many soaps, is derived from rendered beef fat. Soap can also be made of vegetable oils, such as palm oil, and the product is typically softer. An array of quality oils and butters are used in the process, such as olive, coconut, palm, cocoa butter, hemp oil and shea butter. Each oil chosen by the soap maker has unique characteristics that provide different qualities to handmade soaps including mildness, lathering and hardness. For example, olive oil provides mildness in soap; coconut oil provides lots of lather while coconut and palm oils provides hardness. Most common, though, is a combination of coconut, palm, and olive oils. If soap is made from pure olive oil it may be called Castile soap or Marseille soap. The term "Castile soap" is also sometimes applied to soaps with a mix of oils, but a high percentage of olive oil. When fat (or oil) is reacted with lye (sodium hydroxide), the product is a hard soap. When fat is reacted with potassium hydroxide, the product is a soap that is either soft or liquid. Either reaction is known as saponification. The fat is hydrolyzed by the alkali, yielding glycerol and crude soap. Historically, the alkali used was potassium hydroxide, made from the deliberate burning of vegetation such as bracken, or from wood ashes. In the hot-process method, lye and fat are boiled together at 80–100°C until saponification occurs. After saponification, the soap is sometimes precipitated from the solution by adding salt, and the excess liquid drained off. The hot, soft soap is then spooned into a mold. The hot-process method was used when the purity of lye was unreliable, and when naturally produced lye, such as potash, was used. The main benefit of hot processing is that the exact concentration of the lye solution does not need to be known to perform the process with adequate success. Unlike cold-processed soap, hot-processed soap can be used right away because lye and fat saponify more quickly at the higher temperatures used in hot-process soap making. In the cold-process method, fats such as olive oil are reacted with lye, at a temperature that is sufficiently above room temperature to ensure the liquefaction of the fat being used. It requires that the lye and fat be kept warm after mixing to ensure that the soap is completely saponified. The lye is dissolved in water. Then oils are heated, or melted if they are solid at room temperature. Once both substances have cooled to approximately 100-110°F, and are no more than 10 degrees Fahrenheit apart in temperature, they may be combined. This lye-fat mixture is stirred until it reaches a stage called "trace"—the point at which the saponification process is sufficiently advanced that the soap has begun to thicken. (Modern-day amateur soap makers often use a stick blender to speed this process.). There are varying levels of trace: light, medium, and heavy. Essential oils, fragrance oils, botanicals, herbs, oatmeal or other additives are added at light trace, just as the mixture starts to thicken. The batch is then poured into molds, kept warm with towels or blankets, and left to continue saponification for 18 to 48 hours. After the insulation period, the soap is firm enough to be removed from the mold and cut into bars. At this time, it is safe to use the soap since saponification is complete. However, cold-process soaps are typically cured and hardened on a drying rack for 2-6 weeks (depending on initial water content) before use. The common process of purifying soap involves removal of sodium chloride, sodium hydroxide, and glycerol. These components are removed by boiling the crude soap curds in water and re-precipitating the soap with salt. Most of the water is then removed from the soap. This was traditionally done on a chill roll which produced the soap flakes commonly used in the 1940s and 1950s. This process was superseded by spray dryers and then by vacuum dryers. The dry soap (approximately 6-12 percent moisture) is then compacted into small pellets. These pellets are now ready for soap finishing, the process of converting raw soap pellets into a salable product, usually bars. Soap pellets are combined with fragrances and other materials and blended to homogeneity in an amalgamator (mixer). The mass is then discharged from the mixer into a refiner which, by means of an auger, forces the soap through a fine wire screen. From the refiner the soap passes over a roller mill (French milling or hard milling) in a manner similar to calendering paper or plastic or to making chocolate liquor. The soap is then passed through one or more additional refiners to further plasticize the soap mass. Immediately before extrusion it passes through a vacuum chamber to remove any entrapped air. It is then extruded into a long log or blank, cut to convenient lengths, passed through a metal detector and then stamped into shape in refrigerated tools. The pressed bars are packaged in many ways. Sand or pumice may be added to produce a scouring soap. This process is most common in creating soaps used for human hygiene. The scouring agents serve to remove dead skin cells from the surface being cleaned. This process is called exfoliation. Many newer materials are used for exfoliating soaps which are effective but do not have the sharp edges and poor size distribution of pumice. A nature-friendly way of interrupting an ant trail is to pour soapy water on the trail. The soapy water destroys the scent the ants were following to get to food. Today, fat-based soaps have mostly been superseded by modern detergents. Washing agents do not contain soap for cleaning fabric, but for reducing foam. Due to the fact that most commercial soaps eliminate the glycerine from soaps to use in other industries, this deprives the skin of the natural, moisturising glycerine and generally leaves the skin feeling dry. Some antibacterial soaps have chemicals killing bacteria that coexist on the skin's surface and are essential to skin health. Soap-based products often contain the additive sodium laureth sulfate, which research has found to be harsh on skin. This product is also present in many non-soap cleaners for personal hygiene (such as shampoos, bathfoams, toothpaste). Poorly finished soaps contain alkali (NaOH) and react mildly basically with skin and fabric; commercial products are finished to neutrality or to a weak acid content to prevent this and be more compatible with the skin's slightly acidic pH. Commercial products use chelating molecules (sequestrants), often EDTA derivatives to bind with any free Ca or Mg ions and prevent soap scum. These also help reduce fragrance loss, discoloration. and rancidity. Castile soap has a very high alkalinity level, measured at about 9. pH of skin and hair has a slightly acidic pH level known to be about 5 to 6. Due to the high pH level, liquid castile soap is usually not recommended by soapmakers who market this high pH soap for washing hair because it is not pH-balanced and it may cause hair to become dry. In the 1960s, detergent manufacturers waged an advertising battle over who had the longest lasting suds, and detergent compounds quickly appeared in the waterways. Suds began to appear in streams, rivers, and lakes. At the foot of the Niagara Falls, piles of discolored detergent foam rose eight feet high. Detergents also contain phosphate additives to soften the water and thereby improve the effectiveness of the detergent molecules. It was noted that between 1940 and 1970 the amount of phosphates in city wastewater increased from 20,000 to 150,000 tons per year. With the increase in phosphates, algal blooms grew splendidly on the excess phosphorus and consumed the majority of all oxygen in the waters, killing fish and plants. Allowing a detergent to sit on any surface (such as skin or clothes) over time can cause an imbalance in pH and moisture content on the surface, damaging the fabric and injuring the skin. ↑ Pliny the Elder, Natural History, XXVIII.191. Retrieved November 14, 2007. ↑ Soaps and Detergents. Algebra Lab. Retrieved November 17, 2007. ↑ Jim Al-Khalili, Science and Islam Part 2, BBC Productions. ↑ Michael Phillips, Nablus' olive oil soap: a Palestinian tradition lives on Institute for Middle East Understanding (IMEU), March 11, 2008. Retrieved October 14, 2015. ↑ Harald Kleinschmidt, Understanding the Middle Ages: The Transformation of Ideas and Attitudes in the Medieval world (Boydell & Brewer, 2000, ISBN 085115770X). ↑ Raymond G. Bistline, Jr., "Anionic and Related Lime Soap Dispersants," in Anionic surfactants: organic chemistry, Helmut Stache, (ed.) (CRC Press, 1996, ISBN 0824793943). ↑ History of Soap Flakes. Retrieved October 14, 2015. Broze, Guy, (ed.). Handbook of Detergents, Part A: Properties. Surfactant Science Series. New York: M. Dekker, 1999. ISBN 0824714172. Garzena, Patrizia, and Marina Tadiello. Soap Naturally: Ingredients, Methods and Recipes for Natural Handmade Soap. Mayfield, N.S.W. : Programmer, 2004. ISBN 0975676407. Kleinschmidt, Harald. Understanding the Middle Ages: The Transformation of Ideas and Attitudes in the Medieval world. Boydell & Brewer, 2000. ISBN 085115770X. Lange, K. Robert. Surfactants: A Practical Handbook. Munich: Hanser Publishers, 1999. ISBN 1569902704. Maine, Sandy. The Soap Book: Simple Herbal Recipes. Loveland: Interweave Press, 1995. ISBN 1883010144. Stache, Helmut (ed.). Anionic surfactants: organic chemistry. CRC Press, 1996. ISBN 0824793943. Urban, David G. How to Formulate & Compound Industrial Detergents. BookSurge Publishing, 2003. ISBN 1588988686. Glossary for the Modern Soap Maker. Soap making terminology defined. Handcrafted Soap and Cosmetic Guild. Instructions for Making Crock Pot Handmade Soap. History of "Soaps and Detergents"
This page was last modified on 14 October 2015, at 20:33.